This management agreement form documents the management of a doctor group practicing medicine by a medical practice management firm. The doctor group employs or contracts with physicians who specialize in specialty pathology services. The manager is a licensed clinical laboratory. This agreement would be suitable for a doctor manager relationship for any medical specialty, particularly one with lab operations. 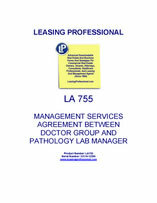 The agreement specifies the authority and responsibilties of the practice manager for the administration and business management of the medical practice, which include arranging for equipment, supplies, non-physician personnel, provision of office space, financial record keeping, and patient billing and collection, among other duties. The doctor group executes a power of attorney in favor of the manager to allow the manager to endorse checks, and sign agreements on behalf of the physician group. A. Group employs or contracts with physicians licensed to practice medicine in the State of ________ (collectively, “Group Practitioners”, and each, a “Group Practitioner”) and provides specialty pathology services and related activities. B. Manager is a duly licensed clinical laboratory (“Lab”). C. Group and Manager believe that Manager’s provision of the services identified in this Agreement will enhance Group’s ability to provide high quality, efficient medical services. 1.1 Financial Management Services. Manager shall provide financial management services necessary and appropriate for Group’s operations, including accounting, bookkeeping, operation and capital budgeting, tax matters, accounts receivable and accounts payable processing, and electronic data processing. All business records, papers and documents shall remain the sole property of Group, shall be available for inspection by Group at all reasonable times, and shall be delivered to Group upon any termination or expiration of this Agreement. Manager shall be entitled to retain a complete copy of all such documents upon any termination or expiration of this Agreement. 1.2 Contracting Services. Manager shall negotiate the terms and conditions of and execute on Group’s behalf all business agreements, including all agreements with lenders, vendors and consultants. 1.3 Day-to-Day Services. Manager shall furnish or obtain all telephones, paging devices, office services (including secretarial, duplication and facsimile services) and any other services of a similar nature reasonably necessary in connection with the day-to-day operations of Group. (c) Banking Powers. To deposit all Collections directly into a bank account held in Group’s name at a banking institution mutually selected by Manager and Group. Manager (and any subcontractor designated by Manager) shall have the right to make withdrawals from such account to pay all costs and expenses incurred in the operation of Group, including payment of the Management Fee as set forth in Section 3.1, and to fulfill all other terms of this Agreement. 1.5 Supplies. Manager shall arrange for non-medical supplies necessary for the proper and efficient operation of the Lab to be delivered to Group. 1.6 Support Personnel. Manager shall provide to Group the support services of non-licensed personnel as reasonably required to support Group’s business operations (“Support Personnel”). (a) Hiring and Termination. Manager shall have the right to hire and terminate all Support Personnel. (b) Compensation and Employee Benefits. Except as otherwise agreed between Manager and Group, Manager shall have the right to determine and pay compensation payable to all Support Personnel, including salaries, deferred compensation, fringe benefits, bonuses, health insurance, long-term disability and group life insurance, workers’ compensation insurance, unemployment insurance, retirement benefits and any other benefits that Support Personnel may receive. Manager shall be responsible for all employee record keeping, payroll accounting (including social security and other payroll tax reporting), income tax withholding, social security and other payroll taxes, forms processing, payroll and Internal Revenue Service filings and records storage and retrieval on behalf of all Support Personnel. (c) Supervision and Training of Support Personnel. Manager shall manage and supervise all Support Personnel, and shall arrange for training. 1.7 Reports. Manager shall provide Group with financial statements relating to Group operations (“Group Financial Statements”) on an annual basis. Group shall, at its sole discretion and expense, have the right to conduct an independent audit of Group Financial Statements. 1.8 Books and Records; Confidentiality. All patient reports, financial records, corporate records, personnel files, written procedures and other such items relating to the business and activities of Group (“Group Records”) shall be the property of Group. Upon any termination or expiration of this Agreement, Manager shall, at Group’s request, transmit all Group Records to Group or to any other party designated by Group. Manager shall have a right to copy all records prior to transmittal, at its expense, subject to applicable law. With respect to patient reports, copying shall only be as applicable law requires, permits, or in connection with a malpractice action involving Manager. Manager and Group shall comply with all applicable laws concerning the confidentiality of all Group Records. Manager and its employees shall keep confidential all statistical, financial, and personnel data relating to the business of Group and Group Practitioners except for any data that becomes publicly available, or any data to which the public has the legal right of access, or that may be rightfully obtained from third parties. 1.9 Insurance. Manager shall assist Group in obtaining malpractice coverage, as set forth in Section 4.1. 1.10 Manager’s Right to Subcontract. Manager may subcontract with other persons or entities for any of the services that Manager is required to perform under this Agreement. 1.11 Exclusive Authority. Manager shall have the exclusive authority to perform all of its duties set forth in this Agreement.